You can quickly update some or all helpers on the Helpers > List page grid. 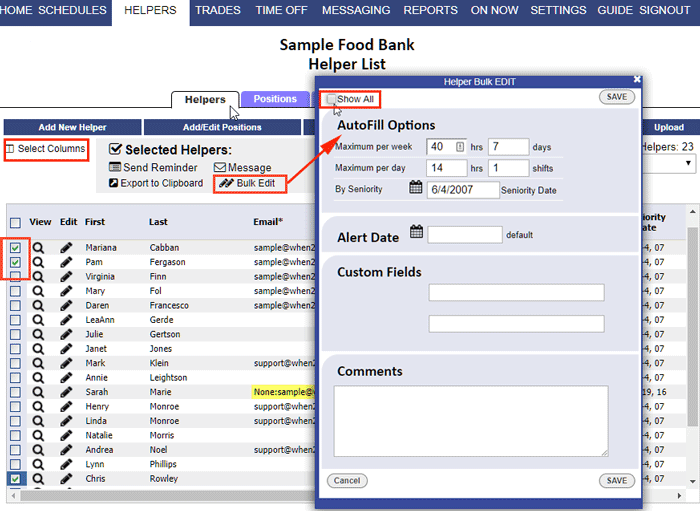 This can be useful to update the AutoFill maximums for a number of helperss at once or to select certain helpers and quickly set them into a Priority Group. When you select helpers and click the "Bulk Edit" link the layer will show you the exact fields that you have already chosen on your "Select Columns" for the grid. If you want to bulk edit other fields you can click "Show All" in the bulk edit layer. Make the changes to fields you want to update for all selected and click Save. If the fields you updated do not show in your grid, use the "Select Columns" to update what the grid displays. Coordinators with permission to change company settings can go to their Settings>Info page and choose to only send Publish Notifications to those who are scheduled in that week. 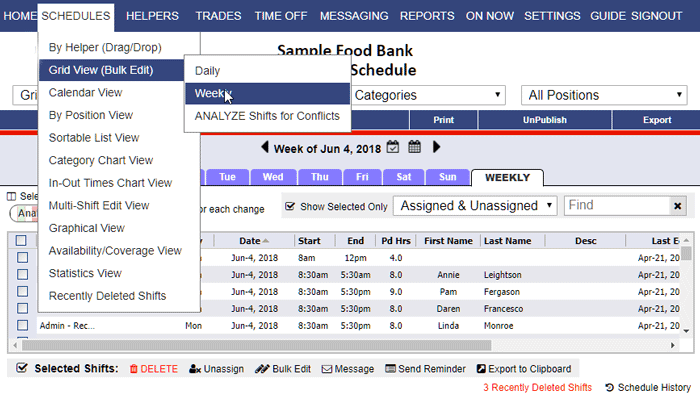 Also coordinators with permission to Add shifts can Restore selected shifts to put them back in the schedule if needed and on published weeks you can check off to send a notification to affected helpers. Note that when restoring shifts our system does not check for conflicts, so you may want to run 'Analyze Shifts' after restoring. Also, all schedule views have a new "Recently Deleted Shifts" count link at the bottom of each week next to the Schedule History link, and the Shift History log of recent shift changes will include when a shift is deleted so you can see that information when running the ‘Export Recent Shift History’ off our “Reports” section. As you start typing in the "Find" box, the grid will be limited to just matching helper on the Helper List pages or to those shifts on the new Shift Grid and Shift Change window. Click the 'X' on the Find box or the yellow filter banner to cancel Find. 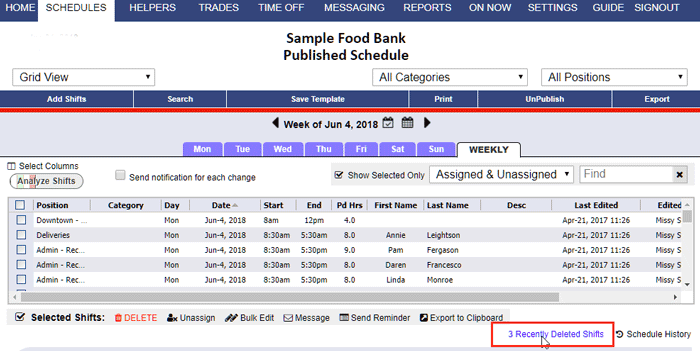 You can check the box to select some or all shifts and then send a message, unassign, send a shift reminder, copy to clipboard or delete the selected shifts. You also can "Bulk Edit" shifts (see below). On the new Shift Grid schedule view you can sort the view, check off all or some of the shifts and then click to "bulk edit" those shifts. Now you can view the list of deleted helpers and sort by any column, and the view defaults initially to put the most recently deleted at top of page. Coordinators with permission to Add Helpers can also Restore a helper, which assigns them a new temporary username and password. It does not reassign them to any previously unassigned shifts. When coordinator or helper add time off, as they choose the number of full days off the calendar will highlight the associated days in the request and the ‘Until midnight on …’ note will make it clear what the end date of the time off will be. Coordinators with permission can set up Time Off "Blocked Dates"
Any date in the future can be blocked. You can block "All Positions" and have no requests for that date or you can specify a position or position group for the block and each date can have any number of positions blocked. Then when an helper who can work that position tries to submit time off that overlaps that date, they will be blocked and told they cannot request that date off. Only coordinators with BOTH permission to "Approve / Deny Time Off" AND "Change Company Settings" can add time off blocks. Other coordinators can see blocked dates but they cannot add or edit them. Now on the Pending Time Off page, you will see a checkbox next to each conflicting shift. If you uncheck a shift and then approve the request, that will keep the helper assigned to that shift. The helper will receive a notification of the time off approval and also be reminded of the shift you chose to keep assigned if that shift is on a published week. Coordinators with permission to approve time off can view and click any Pending Time Off on the By Helper view to approve or deny it right in the popup window. Useful for seasonal organizations who bring back many helpers at once. On the Helpers>Deleted Helpers page, you can now check off a number of helpers and click the "Restore Hleper" link to restore them all at once instead of one-by-one. Now our email notifications are sent out as HTML. If you have any trouble with the format of your notices you can always set your email back to receive the older "plain text" type emails on your Settings> My Notifications page by clicking to Edit the email and choosing "plain text" as the type.